Sir Mixalot-of-ice-tea, keys, gadgets, vox; D Maynard, guitar; A Okey, bass. Onan Spilled his Seed: After eight full innings of play, it remains Satan 6, God 2. Small Engine Repair: This one's for all our friends whose lives just haven't amounted to very much. Or it would be, if we had any friends. McDewey : Sounds like something Steve Miller would have done, had he suffered from dementia. Alison Wonderbread : A yeasty morsel with a happy riff "unconsciously influenced" by The Kingston Trio. Dumber than Me: Music by D Maynard. This doesn't sound like any other Weasel song; many critics agree this is a good thing. Harvey Loped Along : A wholesome idea for a nice little story about cute little bunnies, corrupted. If Eddie Munster had a band, this is what it would sound like. Hall of Pain: A cautionary tale about a poor boy hanged for murder, even though all his victims probably had it coming. And sure, go ahead say it: Beatles. So what? At least it's better than Oasis. Something Wicked : Sort of a tango here, or maybe a foxtrot? Anyway, the moral is that you'll catch more flies with water and vinegar than with honey and vinegar, fnaar. Monument Road: Eugenics in Vermont. Features a real Russian, for authenticity. A Million Vacations : The dissonance in the guitar lines was intended to emulate the grating effects that psychotics experience. A true story. Crogolin Grange : A brassy game-show intro rapidly degenerates into a sinister 6/8 tale of gothic romance. Nineteenth century english gothic mind you, not the kind where dysfunctional teens put on too much make-up and pierce their labias. Where’s Bob Crane? : He's over there in the rutabagas. The Larry Trilogy, part deux. Lemons : This big pile of gold? said the Swiss banker. Well, it's certainly not gold fillings given to us for safe keeping by Nazis until such time as they need it to finance more gas chambers, if that's what you're insinuating. Rachel: Crabs the size of sparrows is probably a little mean-spirited; she did piss bisque though. Hale Bopp : If Marshall Applewhite's spaceship had a cocktail lounge, the combo would be playing this song. Recorded live in front of a dead audience. 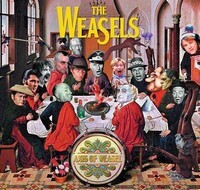 Copyright © 2006 The Weasels. All Rights Reserved.